Home » Gentlemen, Start Your Red Bull Engines! Gentlemen, Start Your Red Bull Engines! 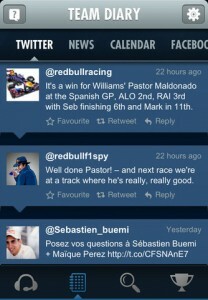 Red Bull Racing Spy iPhone App Review. With just a few days till the start of the Santander British Grand Prix, Formula 1 fans around the world are looking for ways to stay up to date with what’s going on in the pit lane or on the track. 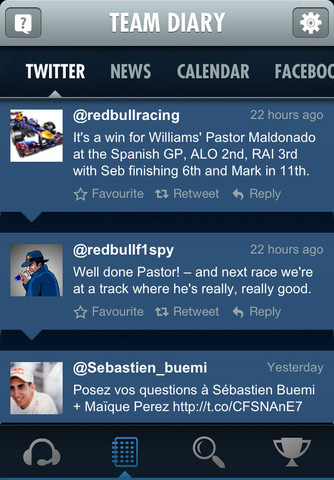 If you eat, breathe and sleep F1, then you need to get your hands on Red Bull Racing Spy and place it right on your home screen on your iPhone and iPad. The app fits both nicely and with the great design it features, you won’t be sorry you spent 5 seconds to download it from the AppStore. Yes, seconds, because the app is free to download. What is Red Bull Racing Spy? 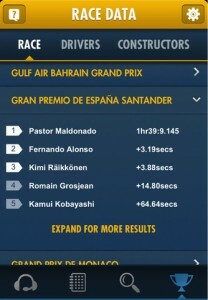 This iOS app will do its best to keep you well informed of what’s going on with the different Grand Prix races around the world, featuring every piece of news on Twitter, Facebook and elsewhere in the news in a cool and easy digestible format. As soon as you start the app you’ll feel right in the middle of the action with the self-updating Twitter feed that’s featured on the home screen. With every Grand Prix race, there will be real-time commentary from Red Bull’s man on the inside. If Twitter is not your slice of pie, perhaps you’d prefer the Facebook feed that the app also features. There’s no signup required. You just tap and read, as easy as that. But what I particularly enjoyed with this app is the ability to add Grand Prix races and special events to your calendar. Just head over to the Calendar tab and press Sync next to the event you’re interested in. I must admit that the wording is not that intuitive in using the word Sync instead of Add to calendar or something similar. I half-expected the Sync button to download additional information about that specific event. And facts is what Red Bull Racing Spy excels at. 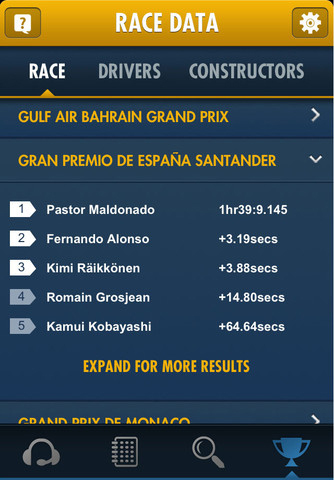 From lap times, track positioning, race facts to driver facts and figures, you get to find out all you need to know about any specific Grand Prix race you’d be interested in. Every race comes with full results and standings along with some specific facts and figures. 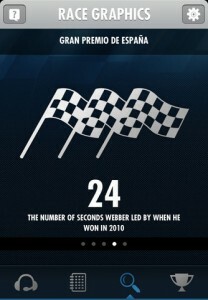 Especially interesting are the info graphics that the app has in store for us. 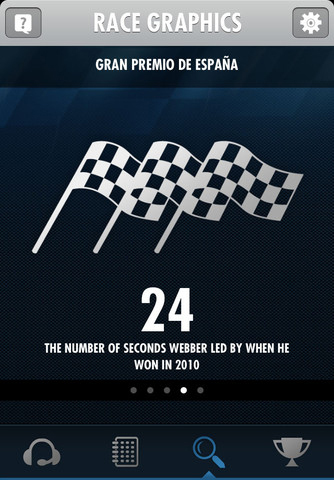 These are a sort of “Did you know that…” facts about races and drivers. For example, did you know that a Formula 1 driver changes gears 4,200 times in the average race? Or that in the Gran Premio De Espana there were 10,700 seats for spectators? 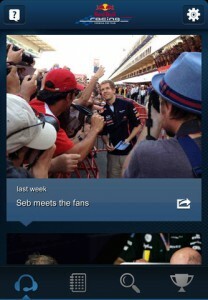 Now, I must admit that Formula 1 is not one of my interests. I would rather spend the day watching a good movie or walking in the park. But that is not to say that I cannot appreciate value and quality, and Red Bull Racing Spy has it all. Bravo! What do you think of Red Bull Racing Spy ? Scroll down for our comment section and let us know! iPhones, yet everyone is still developing apps for Apples store.